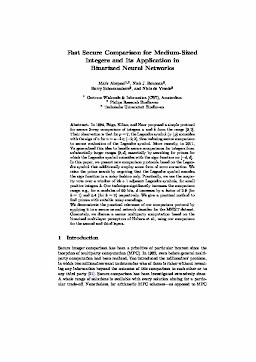 In 1994, Feige, Kilian, and Naor proposed a simple protocol for secure 3-way comparison of integers a and b from the range [0, 2]. Their observation is that for p=7, the Legendre symbol (x∣p) coincides with the sign of x for x=a−b∈[−2,2], thus reducing secure comparison to secure evaluation of the Legendre symbol. More recently, in 2011, Yu generalized this idea to handle secure comparisons for integers from substantially larger ranges [0, d], essentially by searching for primes for which the Legendre symbol coincides with the sign function on [−d,d]. In this paper, we present new comparison protocols based on the Legendre symbol that additionally employ some form of error correction. We relax the prime search by requiring that the Legendre symbol encodes the sign function in a noisy fashion only. Practically, we use the majority vote over a window of 2k+1 adjacent Legendre symbols, for small positive integers k. Our technique significantly increases the comparison range: e.g., for a modulus of 60 bits, d increases by a factor of 2.8 (for k=1) and 3.8 (for k=2) respectively. We give a practical method to find primes with suitable noisy encodings. We demonstrate the practical relevance of our comparison protocol by applying it in a secure neural network classifier for the MNIST dataset. Concretely, we discuss a secure multiparty computation based on the binarized multi-layer perceptron of Hubara et al., using our comparison for the second and third layers.